The weights were revealed yesterday for the BetVictor Gold Cup to be run on Saturday, November 18 with the sponsors’ 7/1 favourite Kylemore Lough, representing Kerry Lee, due to run off 11st 7lbs. Cloudy Dream, who ran so well in the Old Roan Chase at Aintree on his comeback, is one of three horses due to shoulder top-weight of 11st 12lbs although Tuesday’s impressive Exeter winner Politilogue is likely to bypass the race. Malcolm Jefferson’s Cloudy Dream is priced at 14/1 with BetVictor. A terrific card from Newbury this afternoon and Nicky Henderson’s Claimantakinforgan (12.35) finished third in the Champion Bumper at the Cheltenham Festival back in March and can make a winning debut over timber. The selection wouldn’t be the biggest horse in training, but he certainly has an engine and Henderson likes to run some his best novices’ at his local Berkshire track. James Bowen takes off a valuable 7lbs from the back of his father’s Henri Pari Morgan and I know connections believe they have a well-handicapped horse on their hands although he may need further than today’s trip, which is just shy of two-and-a-half miles, to be seen at his very best. The vote goes to Colin’s Brother (1.40) who won first time out last season and represents another in-form father and son combination of Nigel and Sam Twiston-Davies. The selection is still prone to the odd error, but first time out may be the time to catch the seven-year-old. Henderson’s French import Countister (2.10) is a fascinating British debutante having won two Grade 2 Bumpers in her native France and the booking of Barry Geraghty would suggest connections are expecting a bold show on debut. The unbeaten Cap Soleil looks sure to be a warm order having won all three Bumpers for Fergal O’Brien but the ground is not likely to be any worse than good to soft. I wonder if she will need soft ground, especially at the minimum trip, to be seen at her very best over timber. Topofthegame (2.45) makes his chase debut for Paul Nicholls in a first-time tongue-tie and has the scope and ability to make up into a top-class staying chaser. The selection is still only a five-year-old and travelled like the best horse in all three starts over timber last season. He will have benefitted from another summer on his back and is currently 33/1 with BetVictor for the RSA Chase next spring. There is a terrific Mares’ listed chase at Market Rasen and Mia’s Storm (2.00) looked one to follow when making a winning chase debut at Chepstow. A winner between the flags the Alan King-trained mare lacks the experience of many of her rivals, but she looked a natural over fences at the Welsh track and should get a good gallop to chase. A cracking contest with five of the six runners holding a realistic chance at the weights. 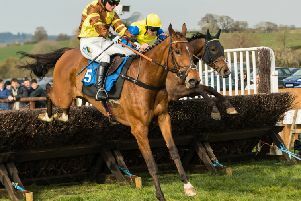 Kap Jazz (2.35) made no show at Carlisle last month but that run should have blown the cobwebs away and the selection has been dropped a couple of pounds by the handicapper. The Venetia Williams yard have yet to hit top form, but this looks a modest heat and Charlie Deutsch is good value for his 3lbs claim. The betting should give us a clue as to stable expectations. At Ludlow, no surprise to see Monbeg Charmer (2.55) switch to a right-handed track having hung badly out to his right, and jumped violently right, at Worcester on his reappearance for Charlie Longsdon. The horse is fitted with a tongue-tie and is 5lbs lower over fences than he is over timber – I always thought he would make up into a decent chaser going right-handed and he must go close in another cracking little heat.